March | 2015 | Oracle Standard Edition – Just love it! Standard Edition Round table in Tallinn in June 11th-12th. The second on the 13th, and it is my favourite – the Standard Edition Round Table by Jan Karremans and Philippe Fierens. 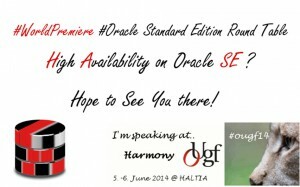 … OUGE Harmony15 – Standard Edition Round table – join us26th March 2015In “Standard Edition”. Just got the confirmation from Ilmar Kerm OUGE that Jan Karremans, Philippe Fierens, and I have been selected to speak at the conference. Philippe has already got the honour to speak at Enkitec #E42015 conference in Dallas, USA the 1st-2nd of June – so he will have a pretty tight schedule. Good question! How about this? these people were surprised by the lack of knowledge. This lead to the idea to promote the Standard Edition Database from within the community. Successfully repeated after the inaugural session at OUGF14, the Standard Edition Round Table is aiding Oracle’s strategy on the “2 Socket Datacenter”. During this interactive presentation you will find out when and why Oracle Standard Edition/ (SE One) can be a good option for your project. In a super interactive way the “presenters” will take you through a number of considerations. From the speakers individual backgrounds, there will be different takes on the topics. As this is made into an interactive round table, in the end of the session, you will have determine the agenda! I will talk about pitfalls, do’s&don’ts, and things that the Enterprise never have thought about when making the purchase desicion. See you in Tallinn in June. It is a lovely city in the summer – worth visiting! 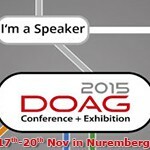 I have not yet seen the speakers list, but I can bet there will be a lot of very good speakers!